God doesn't just have something to say to us as adults in this week or prayer... He has something He wants to say to our children too! Why not take some time each day this week, as a family, to talk to God and hear what God has to say. Maybe you could even give your children the choice to take some time out from normal activities each day e.g. cut digital time short // making different choices.. instead of juice have water // no sweeties for a week! We want our children to make the choice to fast to focus on God, asking for His help and giving time to hear what He has to say to them. As when we fast and pray things happen!! Our forth finger prayer is saying sorry to God. When we come to God and say sorry for what we've done wrong God forgives us and then our wrong doing is gone. God has forgotten it and the slate is clean! 1) Get papers/pens and a worship song from YouTube. 2) Sit round a table or on sofas and privately think about anything you want to say sorry for and write it down on the paper. 3) Get a bowl of water/ matches and go outside. 4) Adults set a piece of paper, one at a time, on fire and then drop the residue into the bowl. As a family talk about how incredible our God is, that when we say sorry, our sins are wiped clean and God keeps no record of our wrong doing. That is how much he loves us. 5) Pray together, saying sorry for doing wrong, and praise together that Jesus died on the cross to take away our sins!!! You've heard of Cbeebies story time... For our week of prayer we are doing a 📖 story time 📖 every evening which links to the prayer activity you have been doing with your family! This evening's story is on Jesus' mission on earth!! We want to praise God today because he is such a Great and Big God yet he loves our children so much and wants to spend time with them today! 1) Find some bed sheets / throws / furniture and as a family build a den together. 2) Gather your pillows and duvets to make it comfy inside! • Read Matthew 19 where Jesus stops what he is doing to be with the children. • Pick some YouTube hilsong kids songs and put them on. 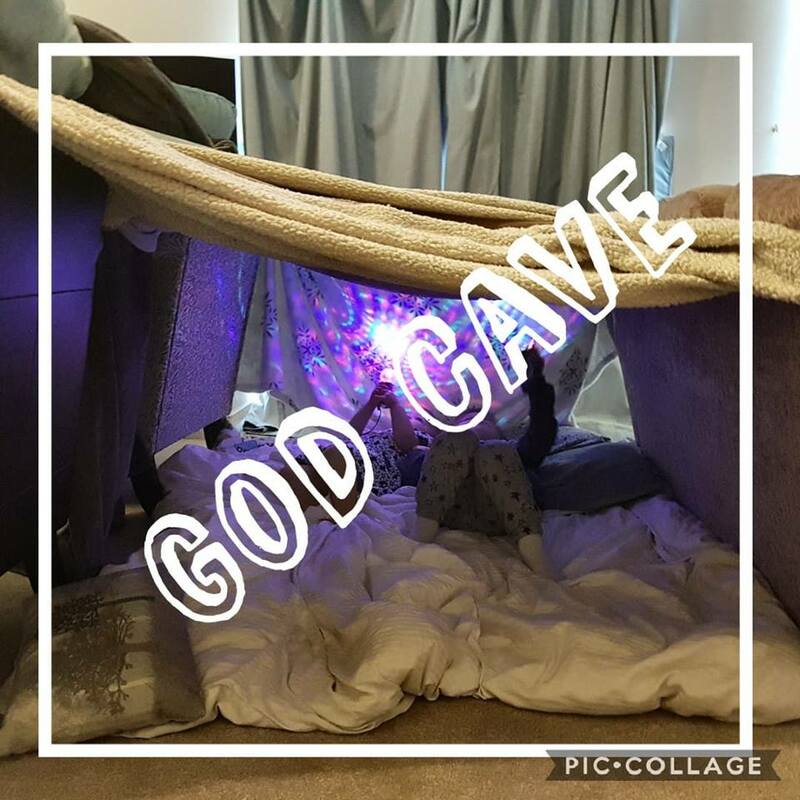 Have a mini praise party in your den with Torches. • Catch a prayer: use a teddy or a ball to throw to each other in the den. When you catch the teddy you can say what you are thankful to God for. This evening's story is on how much God LOVES to spend time with his children. When we talk to God a great way to start is by SHOUTING OUT the names of our Great God and what He has done, so we can remember and declare who it is that we are bringing our prayers too. 1) Parents/carers pour boiling water into a bowel with a few tea bags, leave to brew for 10/15mins. 2) Whilst the tea is brewing go on a treasure hunt searching for things outside your house that can help describe characteristics of God. 3) Collect these items and bring them back into your home. 4) Brush the tea bags across paper to make a tea stained effect. 5) Listen to songs describing who God is e.g. https://youtu.be/jOGbd5CVlP4 while you make your collage of your chosen characteristics of God. 6) Once the tea has dried write God characteristics onto the paper and place above your collages. 7) Pray together as a family declaring how Great, big, awesome God is! This evening's story is on how GREAT is our God. God doesn't just have something to say to us as adults in this week or prayer.. He has something He wants to say to our children too! 1) Choose 1 of the following your hand, paper/pen, play dough or even paint if you're brave enough. 2) Draw around your hand or make a hand print. 4) Pray these through with your children as a way to learn that praying is simply talking to our Heavenly Father who loves them so much, and who always listens and answers our prayers!